Two plays. Two views of the world. One terrifying subject: the blindness of humankind to the mysteries of our existence. "Not to know where one is, not to know where one has come from, and always darkness, darkness! I would rather not live." Rachel with Designer Jacob Hughes. Directed by Benji Sperring. Terrifying void … The Blind. 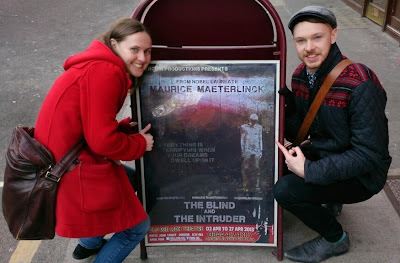 It's a good bet that not many British theatre-goers are intimate with the work of Maurice Maeterlinck (1862–1949). Yet in his day this Belgian playwright and symbolist poet, who won the 1911 Nobel prize for literature, pioneered drama built out of stasis, silence and lack of overt conflict. While these two short plays dating from 1890 now seem like historical curiosities, you can detect their influence on the work of Beckett. The Intruder, played first, is a spooky piece in which a family is gathered to await the arrival of a sister of mercy to attend an ailing woman: the flickering light, the silence in the garden and the blind grandfather's sense that death has entered the room put me in mind of the ghost stories of MR James as much as the theatrical avant garde. What Maeterlinck understood was that waiting is itself inherently dramatic. In The Blind, we see a group of sightless people apparently abandoned on a desolate island clifftop by the priest who cares for them: filling the terrifying void with fractious argument and speculation, they suddenly stumble across the corpse of their protective pastor. You can measure how much times have changed by contrasting The Blind with Brian Friel's Molly Sweeney: to Maeterlinck, the sightless were symbolic victims living in unrelieved darkness, where Friel focuses on his heroine's rich interior life. But, if you strip away the gothic element in Maeterlinck, you can see that he was edging towards a new kind of drama in which waiting was as important as arrival, and the image mattered as much as the word. 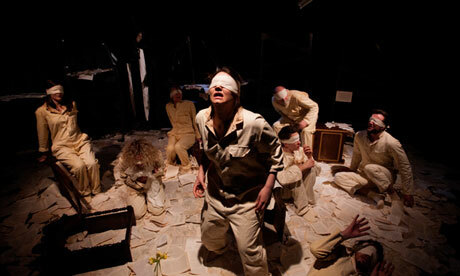 And it is the images I shall remember from Benji Sperring's production: vividly designed by Jacob Hughes, The Blind shows white-uniformed characters sitting on a floor strewn with paper and domestic detritus, as if survivors of some natural disaster. In an eight-strong cast, John Canmore as the tetchy grandfather and Gina Abolins as a wistful romantic stand out. While this revival is a fascinating collector's item, it also demonstrates that Maeterlinck suffered the fate of many artistic revolutionaries – seeing his ideas absorbed into the mainstream. ...so, very well done to Rachel and all those involved in the production!